Get your feet up and the kettle on. This might take a while. 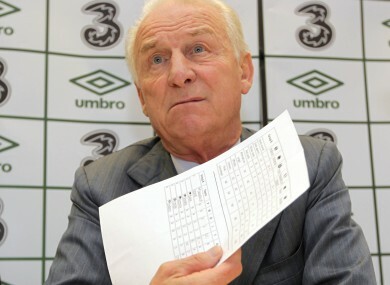 Giovanni Trapattoni meets the press this week. Will Leitch, writing for New York Magazine, dares to ask a question the rest of the sporting mainstream has been ignoring for decades: when will a gay professional athlete finally come out? The intrepid Joe Posnanski spends the evening of the Moneyball premiere with Bill James, the man behind the development of sabermetrics, in this “curiously long post” for Sports Illustrated. 3. “Because he is so alert and because his legs never stop running, he remains ahead of the others, chasing the ball, making tackles when opponents might think they are through. Breath plus brain, ticker plus tackle equals McCaw. Richie McCaw has been thrusting an interfering hand into rucks for over a decade now, the sudden realisation of which has prompted the Guardian’s Eddie Butler to take a closer look at the keys to the great man’s longevity. ATP Tour players, led by moaner-in-chief Andy Murray, threatened to go on strike this week in protest at the number of the tournaments they’re expected to compete in throughout the year. The Daily Telegraph’s Alexandra Willis examines their case and finds that, unbecoming tantrums aside, they may well have a point. Grantland’s Erik Raskin draws on the memories of participants, media analysts and industry insiders alike in the this compelling recreation of “Sugar” Ray Leonard vs. “Marvellous” Martin Hagler, possibly the iconic fight of the 1980s. The former Chelsea manager sits down with Matt Lawton of the Daily Mail. Email “The Sports Pages: some of the week's best sportswriting”. Feedback on “The Sports Pages: some of the week's best sportswriting”.